Keeping a loved one’s memory close at Christmas, this brilliant clear glass ornament bears the words, “In Our Hearts Forever”, and will be personalized with lasting sentiment. 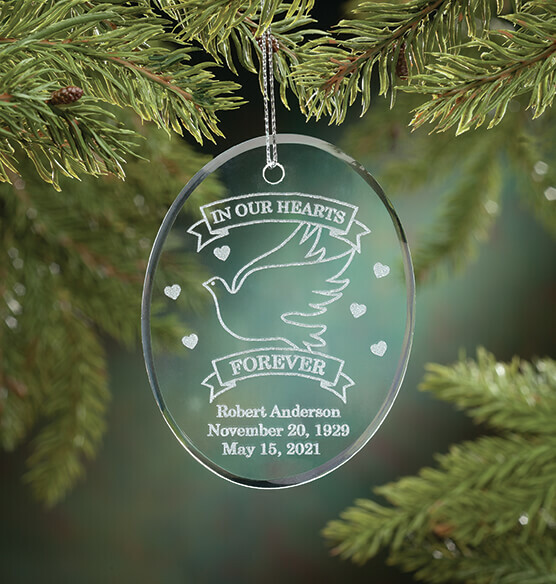 Designed in lasered glass, this memorial Christmas ornament offers lasting beauty and heartfelt comfort. Specify name, birth date and death date; limit 3 lines, 18 letters/spaces each. 2 3/4"L x 3 3/4"W.
Please note: "To" is not standard between dates; if you would like to use it, please include it when entering personalization. The personalized memorial ornament is the perfect way to illustrate a memorial to your loved one. It expresses your feelings and is respectful at the same time. My siblings all loved it and had nothing but compliments. I absolutely love my personalized memorial glass ornaments. The quality is excellent and they both look beautiful on my Christmas tree and will be hung on my tree for years to come. My entire family loved them. Thanks so much for making my memories a treasure to hold onto forever. Beautiful ornament to remember a loved one. The etching in the glass is very clear and detailed. I received the ornaments with in a week, so the processing and shipping was a lot faster than expected. Very nice quality for a resonable price. I was a little skeptical about ordering this online without being able to actually "see" the real thing. I decided to go ahead since it was really important to me to memoralize my brother's passing with a special ornament for the Christmas Tree. I was really pleased when it arrived to see that is was very nice for the price. I plan to order some additional ones. We proudly display this ornament on our Christmas tree. Great way to remember loved ones. I bought this for a family member who lost their husband. It makes a beautiful ornament honoring their loved one each year on the Christmas tree. I have used this item several times to give to a grieving friend or loved one. It is a nice way to remeber someone especially at Christmas when memories of those we have lost come flooding back. It is a christmas ornament,but I put the one for me on a stand to display year around. I purchased this item for a very good friend of mine who lost his father. He was speechless when he opened the ornament. It is beautifully made, and he plans to display it year round. I purchased 5 of these. One for myself and 1 for each of my step-children. When I saw it in the catalog and started crying I knew that this is what I needed to get for each of us to remember our loved one. How beautiful and special. I am going to put a backing on it so it is easier to read and display it all year. This ornament is for my two kids representing their dad who passed away from heart attack/lung cancer. My husband now thought that it would be a perfect gift for them. Joe always wants the kids to have memories and thoughts of their dad. My kids will cherish this for the rest of their life. this was a very good quality for its price. the lettering was very nice. IT was just what I wanted .I am very pleased. This is a great memorial ornament for your Christmas tree. This is the third one I have bought. Also got them for my sister and brother. Ordered this because this is the first Christmas without my sister who passed away in June. Was very pleased with it and can use it in a pot plant or small easel year round. These are classics for the tree. the lights make them shine. This is a very nice ornament to remember a loved one. I have 4 of them and hang them on my Christmas tree every year. This is a very beautiful ornament to remember a lost love one. It will be on my tree for years to come. father just passed & fatherinlaw passed 16 years ago & they both cried when we gave it to our mothers at christmas. ordered 4 2 for us & one for each of our mothers. will hang in our windows they are beautiful. I bought this as a gift for my friend last year when her husband passed away. It is very beautiful and classic. You can hang it on your tree or you can hang it all year long. Great price also. Would buy product again - and I did. A lasting, visual memorial ornament for our Christmas Trees. My husband & I wanted the family to have a momento of his father, who passed away to years ago, with us during the Christmas Season and this ornament will be a small way for us to cherish his father every year. I have these hanging on my tree to honor 3 siblings who have passed. I had ordered this with D A D as the inscription. It arrived with Dad inscribed on it. The engravers don't follow directions. It is all scrunched up in the middle, not spaced or capitalized. The whole point of ordering this was the personalilazation. As you can plainly see here D A D stands out much more than Dad. Other than not being engraved properly, it was what I expected. However, I would not reorder this product because of the lack of the customers wishes. The engraving came out beautifully; but, the ornament hook hole is off centered and the ornament hangs asymmetrically crooked! This was in memory of my great grand daughter who died in the womb. It is beautiful. It is the engraver who didn't have any common sense. I put one date. We don't know when she died. I put just the month and year. The engraver put the month and year on the first line and then put same below. What was he thinking of or wasn't he thinking? I cried when I received it. These glass ornaments had no green background as the picture in the catalog showed. Very disappointed as hard to read the characters. This was to be a gift for our grandchildren who lost their Opa. But the ornament was beautiful, no cheap plastic.